What are the current challenges facing the (professional) drone market? The professional drone market is currently highly fragmented and lacking structure, with myriad different companies, some focusing on hardware, others on software and others still solely addressing vertical markets. Products generally have poor capabilities and are difficult to integrate. Furthermore, with no clear ecosystem, we are seeing a number of partial solutions – often overly complicated, prohibitively expensive and generally inefficient. How is Atlas addressing these challenges? As an aerospace company, Atlas is utilizing its expertise to simplify complex aeronautical technologies to provide fully autonomous drone-based solutions for professional use. We understood early on that we needed to have in-house capabilities to create a complete solution: hardware, software, testing, standardization, integration and more. Building our drone platforms from the ground up, we continue to work to the goal that drones should become accessible everyday tools that optimize time and money while saving lives. We are the only company providing a full “off-the-shelf” solution with unprecedented capabilities. This includes a compact and highly durable drone platform, with versatile exchangeable payloads, and a seamless operating system, enabling both autonomous and semi-autonomous flight. What are your current product offerings? The Atlas Pro drone comprises proprietary and patented technologies, including an aeronautical tri-copter design, a lithium-silicon smart battery, and full carbon fiber construction. 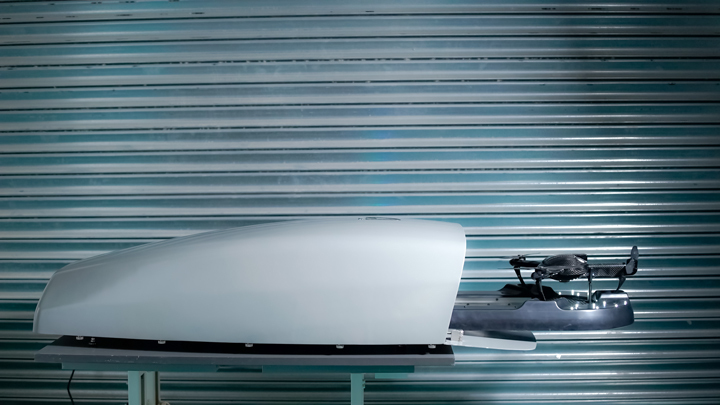 Highly durable and lightweight, it can perform in extreme weather to IP-52 standards and is capable of 55 minutes of flight time, speeds of up to 140km/h, and a range of 50km. The Atlas NEST is a protective smart docking station, facilitating fully autonomous Beyond-Visual-Line-of-Sight (BVLOS) operations of the Atlas Pro drone. For extended flight time, the Atlas Pro can land autonomously in a NEST station where a robotic arm changes the drone’s batteries, enabling the drone to continue flying to mission completion. Our third product is the Atlas Blue-J, a fixed-wing UAV with a 3.5-meter wingspan, between four and six hours of flight time and an operational range of 150km. It can be operated in both autonomous and semi-autonomous modes, and can carry a payload of up to 9kg. What are the key markets your solutions address? How are Atlas' solutions different from other drone solutions on the market? Our products bring the efficiency of aerospace technology to the drone market, resulting in highly advanced and fully autonomous solutions. Our products comprise a full solution, developed entirely in-house and according to our specs. This is significantly different to the rest of the fragmented drone market, which tends to be built on a do-it-yourself basis. Consequently, our drones have unprecedented capabilities, as I’ve outlined above. The goal is to make complex aerospace technology accessible to every professional user, so ease-of-use is a major driver in our product design. When will your solutions be introduced? The Atlas Pro drone, NEST docking station and Blue-J UAV were all launched at this year’s InterDrone conference in September. Sales of the Atlas Pro are commencing this quarter. The Atlas NEST will be available for sale in the first quarter 2018. Are there other markets that you see as being appropriate for drone technology? We see the potential future for drones to become the working tools of the future and therefore capable of addressing specific requirements for any industry. How will you find new markets for your services? The challenge will be uncovering the pain points that companies in each industry face. In some cases, professionals in a given industry don’t know that we might be able to address these issues with drones. As a company, we believe in taking a "Human Centered Design" approach. We have formed a Service Design team that will conduct innovation workshops with strategic partners in order to uncover these pain points and find the right solutions that our drones can provide. What are the long-term plans for the company? Our goal is to redefine the professional drone market to become the leading provider in this space. We aim to achieve this through continuing to simplify cutting-edge technology into seamless and accessible products, capable of meeting the demands of numerous applications in multiple verticals of focus. From multi rotor, to fixed wings, VTOL UAVs and beyond, drones are just the beginning. Our aim is to take an active role in defining the new aerospace market. Ivan Tolchinsky is an aerospace engineer with extensive experience in the aerospace industry in the fields of product design and management, aeronautic calculation and complex materials manufacturing. He has 19 years of experience in aircraft modeling. 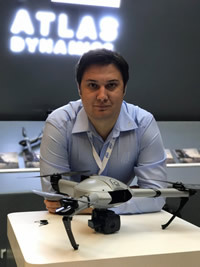 Based on his industry experience, Ivan believes drones should be better, with improved capabilities, design and usability. Driven by his passion and expertise in the aerospace and drone industries, Ivan founded Atlas Dynamics, where he serves as CEO. He has a B.Sc. from the Aerospace Faculty of the Technion – the Israel Institute of Technology. IPR Robotics offers a wide range of servo-driven 7th axis linear rails for industrial robots. These rails come in ten different sizes and are constructed from modular high strength extruded aluminum sections to handle payloads of 100 kg to 1600 kg or from steel to handle 2000 kg payloads. This variety of rail sizes allows each application to be sized correctly, controlling the space required and the price point. The drive train design of these rails utilizes helical gear-racks and is proven over 10 years to be repeatable and reliable, even in tough foundry applications.